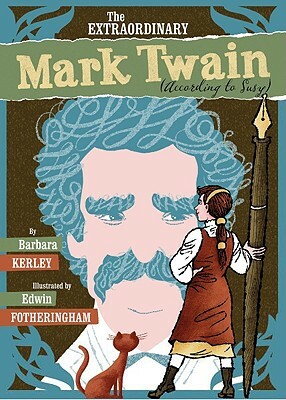 The Extraordinary Mark Twain (According to Susy) by Barbara Kerley, illustrated by Edwin Fotheringham. (Grades 2-5.) Scholastic, January 2010. Unpaged. Review copy provided by my local library. This title has been nominated for a Cybils Award and this review reflects only my own opinion, not the opinion of the panel. So, biographies of Mark Twain. They've been done, right? But this one stands out from the crowd. Why? Because it was written by Susy Clemens, Mark Twain's 13-year-old daughter. It's absolutely true that Susy Clemens started writing a biography of her father when she was 13. Using quotes from Susy's biography, Barbara Kerley gives us a unique picture of the famous author Mark Twain, the author as seen through the eyes of someone who knew him best. The book describes how Susy observed her papa and wrote down the truth about him. Small insets between the pages provide quotes from Susy's actual manuscript, a document that currently resides at the University of Virginia Library. The large pages and bold illustrations fit well with the subject matter - a man who was larger than life. I love the varied facial expressions of the people depicted in the book and the author and illustrator do an excellent job of portraying the many moods of Mark Twain. I was a big fan of Edwin Fotheringham's work in last year's Mermaid Queen by Shana Corey, and I'm a big fan of these illustrations as well. Kids will delight in reading the words (misspellings and all) written by an actual kid. An author's note provides more information about both Mark Twain and Susy Clemens. The book includes a timeline and a list of sources, as well as Barbara Kerley's tips for "writing an extraordinary biography". Check out more reviews at INK, The Fourth Musketeer, and Writing and Ruminating. The Extraordinary Mark Twain (According to Susy) is on shelves now! Happy Nonfiction Monday! Head on over to Shelf-employed for the roundup!